This bracelet will quickly become one of your favorites to wear! It's bright, funky and full of personality. It's perfect for summer. I made all of the glass lampwork beads on this bracelet. 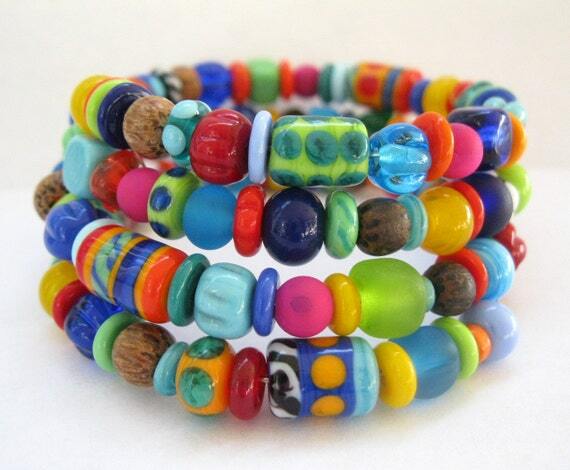 The beads are a eclectic mix of lampwork beads made from bright Moretti glass rods. There is a mix of shapes and patterns. Many of the beads were made with twisties and some of the beads have been etched. I would describe the style as BOHO, Hippie or maybe even tribal. Pure Whimsy!